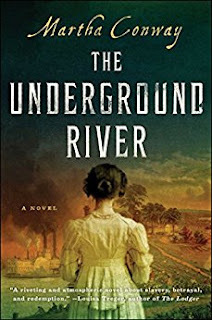 THE UNDERGROUND RIVER (on-sale June 20, 2017; Touchstone) by Martha Conway is set aboard a nineteenth century riverboat theater, the novel is the thought-provoking story of a charmingly frank and naïve seamstress who saves runaway slaves on the Underground Railroad, jeopardizing her own livelihood while discovering the courageous and honorable woman in herself. Booklist raves, “Readers will profit from narrator May’s attention to detail and will appreciate the richly drawn showboat and the North-South border setting.” The book was also mentioned in a recent Los Angeles Times piece about the influence of the Underground Railroad on books, plays, television and more: http://www.latimes.com/entertainment/arts/la-ca-cm-underground-railroad-20170319-htmlstory.html. 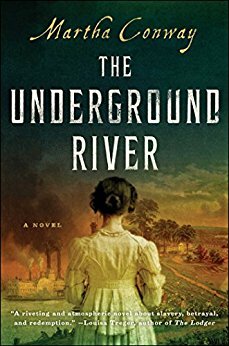 Though fiction, THE UNDERGROUND RIVER illuminates a dark time in American history—when helping those running to freedom could be the most dangerous act anyone could do. Steeped in history, the novel is a portrayal of life on the Ohio River (Conway is from Cleveland), the often dangerous and precarious natural division between the North and the South—the free and the slave-holding states—in antebellum America.